The political unrest in the Maldives deepened further when the police used force to crack down on Maldivian opposition leaders, who continued to hold anti-government protests. More than 30 people have been arrested so far. The Maldivian police forces have not revealed the exact number of the arrested people. Also, the right to a lawyer has been denied for protesters. Not only the opposition leaders and the protesters but the Maldivian journalists too bore the brunt of the police force, who were covering the ongoing protests in Male. A journalist from the RaajjeTV, a TV station in the Maldives, was hospitalised after he was severely beaten by the police. The RaajjeTV captured the ordeal in a post on Twitter. "#RaajjeTV's journalist @HucenHassan passed out on the way to hospital, he is still unconscious, severely beaten during arrest." The military in the Maldives on Wednesday reportedly threw around twelve Members of Parliament (MPs) from Joint Opposition out of the Parliament building in Male. 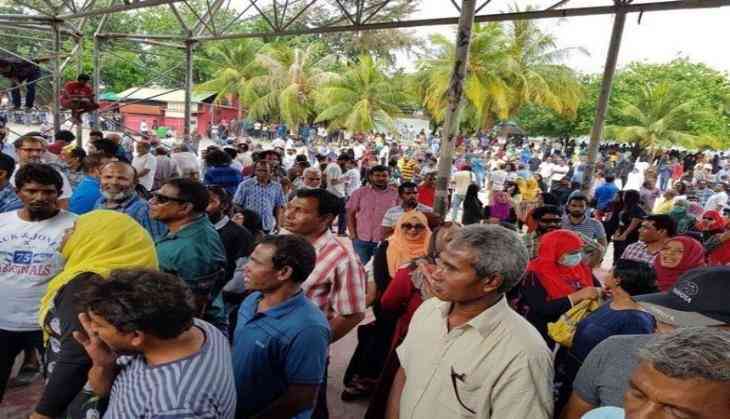 A joint opposition in the Maldives on Friday issued a call for the United Nations (UN) to immediately intervene in the island nation's political turmoil and to put an end to the emergency imposed by President Abdulla Yameen. On Saturday, embattled Maldivian President Abdulla Yameen refused to meet with diplomats from the European Union, Germany and the United Kingdom after the state of emergency was imposed in the Maldives last week. Earlier, the United Nations High Commissioner for Human Rights, Zeid Ra'ad Al Hussein, termed the Maldives' state of emergency as an "all-out assault on democracy". The UN Secretary-General Antonio Guterres also appealed to the Maldivian government to lift the emergency soon. The Maldivian capital remained tense for the last two weeks as opposition leaders across were being rounded up and placed under detention as Yameen, who has been refusing to obey SC's orders directing him to release nine prominent leaders from prison, gave sweeping powers to the security forces. Last Monday, former Maldivian President Maumoon Abdul Gayoom, Chief Justice Abdulla Saeed, Supreme Court Justice Ali Hameed and Judicial administrator Hassan Saeed were arrested by the security forces after Yameen declared a state of emergency in the country. The arrests indicated that the crackdown on the opposition intensified. The country's National Defence Force also stormed inside the Supreme Court (SC) premises in Male last week. On February 2, the Maldivian Supreme Court acquitted former Maldivian President Mohamed Nasheed, former Maldivian Vice President Ahmed Adeeb and ordered the reinstatement of the 12 other parliamentary members.